The advantages of social media are obvious — staying in touch with friends and family no matter where they are, meeting new people that share a common interest, receiving feedback on questions and ideas and sharing multiple viewpoints. 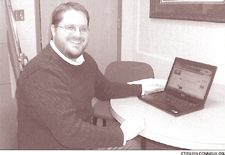 And, as Sean Ater, pastoral associate for evangelization and catechesis at Immaculate Heart of Mary Parish (IHM) in Anderson Township, has discovered, technology and social media are effective and meaningful tools that help carry out his ministry. That passion led Ater to the University of Dayton, where he earned a bachelor’s degree in religious studies and master’s in pastoral ministry. After college, he worked as the director of religious education at St. Elizabeth Ann Seton Parish before being hired at IHM in 2008. He has set up a Facebook page for IHM that promotes parish events, including upcoming speakers and programs, features Father Tom Kreidler’s pastor’s letter and enables Ater to share faith formation articles he feels would of interest to parishioners. Also available is information about parish ministries, reminders about special collections and a mid-week meditation to inspire parishioners. Ater has found the interactive aspect of Facebook to be meaningful, offering parishioners the opportunity to comment on and discuss what is posted. In addition, Ater makes use of podcasting to post the homilies Father Kreidler and Father Robert Hadden, parochial vicar, have given, along with various faith formation talks. He has used YouTube to post a video tour of Immaculate Heart of Mary Church, complete with descriptions of the symbols and artwork throughout the structure, along with their liturgical significance. Ater established a LinkedIn group for IHM members. The professional social media site gives parishioners the chance to network with each other and enables Ater to connect with them and encourage the use of their gifts for the faith community. Ater said the use of technology and social media is part of IHM’s multifaceted long-range plan and that there has been ongoing discussion about how it can be used to increase parish engagement. Social media seems to be catching on at IHM and feedback has been positive, said Ater. The parish’s Facebook page currently has 261 fans, and there are 90 people following IHM on Twitter. “I’ve had people come to a parish event and tell me they saw it on Facebook,” he said.